Club SOTA at the School of the Arts is an ideal location for small one or two person shows requiring very minimal technical reinforcement. 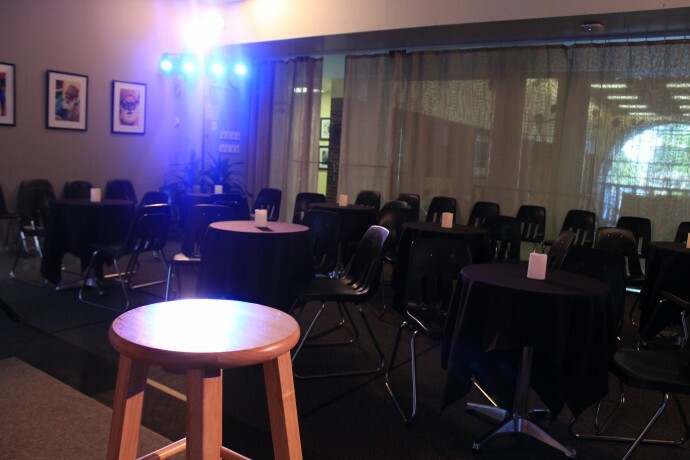 Club SOTA is perfect for stand-up comedy, spoken word or improv performances. The area does not include wing space or a back-stage cross-over. The flexible seating can accommodate 40-50 people comfortably and will be set with carpeting, café tables and chairs. The raised stage area is flanked by two floor-to-ceiling windows and the room includes a charming, cozy fireplace. Lighting trees and minimal sound reinforcement are included. There is no storage space available; dressing rooms and performer restrooms are located on the same floor within close proximity to the space. Club SOTA is best-suited to performances that depend on the strength of the performer and/or the written word, and not on complicated production needs. Club SOTA is fully handicapped accessible via elevator. Please Note: SOTA does charge a nominal technical fee for the Fringe performances we host. 50 seats arranged as The flexible seating can accommodate 40-50 people comfortably and will be set with café tables and chairs. Club SOTA is fully handicapped accessible via elevator. Yes, same floor dressing room/restroom.